Earl Klugh is an American smooth jazz/crossover jazz/jazz fusion guitarist and composer. "Earl can wail with the best jazz players, but he prefers to touch people emotionally," asserted legendary guitarist Chet Atkins in Guitar Player. "He reaches your heart with that romantic special something, and he does it with taste and class. You can't say that about many guitarists." Appropriately, it was Atkins who inspired Klugh in his early teens to approach the guitar in a manner that continues to distinguish him from other players. Klugh explained this approach in Down Beat as addressing the guitar "in a chordal way, more like a piano player instead of just one note at a time." In fact, Klugh began his musical career on the piano. Born in Detroit on September 16, 1953, Klugh commenced formal training on the piano at the age of three. After playing that instrument for seven years, Klugh switched to the guitar. By the time he was 13, Klugh disclosed to Down Beat, he had made up his mind that playing the guitar was what he wanted to do. Klugh's enthusiasm for the guitar was encouraged by the increased attention given to folk music in the 1960s. The young player was particularly inspired by the popular trio Peter, Paul, and Mary, as well as by folk troubadour Bob Dylan. In addition to his interests in these performers, Klugh listened to a great deal of Spanish guitar music. As writer Bill Milkowski explained in Down Beat, Klugh's appreciation for folk playing and Spanish guitar led him to experiment with a method of fingerpicking that he applied to the popular songs of that time, especially those by Beatles. It was at this point, in his middle teenage years, that Klugh discovered Chet Atkins. As Klugh stated in Down Beat, "I saw him on television, and he changed my whole concept of playing. He was the only person I ever heard up to that point who played the instrument like I wanted to hear it played, playing chords and melody simultaneously with a finger-style technique. In the next eighteen months after seeing him on TV, I bought forty of his albums and listened to them until I was able to copy from them." While teaching guitar and working at a Detroit music store at the age of 16, Klugh was "discovered" by jazz great Yusef Lateef. Lateef invited Klugh to participate in a jam session at the world-famous Detroit jazz club Baker's Keyboard Lounge. Impressed by the teenager's playing, Lateef asked him to appear on his album Suite 16. Despite this dramatic development, Klugh chose to finish high school before embarking on a full-fledged professional career in music. After graduation, Klugh was introduced to jazz guitarist George Benson at Baker's. The two quickly became friends and when Benson came to town thereafter he would invite Klugh to sit in with him. After a year of working intermittently with Benson, Klugh was formally invited to join the group. This professional relationship resulted in two albums, Body Talk and White Rabbit. Speaking of his days with Benson, Klugh related in Guitar Player, "That was the best musical experience of my life. George taught me a lot about playing, and I also learned the potential of an acoustic guitar in an electric setting." After his tenure with Benson's ensemble, Klugh accepted an invitation to join Chick Corea's Return to Forever. Although he only played with that group for two months, the experience made a lasting impression on him. As he recalled in Guitar Player, "Playing with Chick was great. It made me realize that writing my own music and developing my own style and identity was the way to go." His musical apprenticeship behind him, Klugh broke out on his own and was quickly signed to a contract with Blue Note Records. 1976 saw the release of his first solo album, Earl Klugh. In his few years with Blue Note, Klugh produced several albums, including Finger Paintings, Living Inside Your Love, and his first gold record, Crazy for You. Capitol Records acquired Blue Note in 1979, shortly after which Klugh cut Late Night Guitar, Low Rider, Wishful Thinking, and Night Stories. While at Capitol, Klugh first collaborated with pianist-composer Bob James, ultimately producing two albums, the Grammy Award-winning One on One and Two of A Kind. Klugh remained with Capitol until the mid-1980s, at which time he moved to Warner Bros. where he continued his prolific recorded output. He joined forces again with George Benson to produce Collaboration in 1988. He also released Life Stories, Whispers and Promises, Solo Guitar, and Midnight in San Juan while at Warners. Despite Klugh's collaborations with various jazz artists and the media's categorization of his work, as a solo artist he does not consider himself a jazz musician. He explained in Guitar Player, "There is an element of jazz in my music, but basically it's pop. I have trouble with the label 'jazz.' Number one, as a player, I'm not comfortable with all forms of jazz.... Some musicians are purists, but my music derives from what's on the radio. The fact that I'm an instrumentalist leaves record companies and radio with only a couple of categories to put me in: rock or jazz. It's a convenient way to market an individual. Also, jazz is a label that's easily hung on a black musician." Resisting this pigeonholing, Klugh has nonetheless managed to create a distinct space for himself in the music world, one that has attracted a large and appreciative audience despite its lack of a name. 1993 found many jazz guitarists recording albums of standards. Klugh's response was Sounds and Visions, Vol. II. Showcasing what Downbeat called "his trademark classical guitar sound," the record reprised songs from such films as Goldfinger, Tequila Sunrise, The Thomas Crown Affair, and Calamity Jane --all enhanced by the London Royal Philharmonic Orchestra. Downbeat deemed the record, a vehicle for the Earl Klugh Trio--Klugh, Gene Dunlap on drums, and Ralphe Armstrong on bass--"big, lush, and hummable." Klugh remarked of Vol. II, "The project was good to do because so many guys are having standards albums. I wanted to find things that nobody does, with the exception of a couple of things that I could find my own way to do." Of the prevailing nostalgic bent among his peers, the guitarist said, "When I first started, the whole instrumental market was much smaller. You must have 10 times as many instrumental artists recording now. Everybody's vying for the same dollar and the same radio space. That's one reason that musicians who have any ability at all will go out and do it ... just to maybe differentiate themselves from the masses." He earlier revealed to Downbeat his own approach to the standards, stating that the renewed emphasis on old tunes "suits my own taste: I lean towards the melodic stuff, no matter what era it's from." As reviews of Klugh's music indicate, his listeners are attracted to these melodies and the ways in which he makes his guitar "sing." While this aspect of his playing has indeed garnered a large following, it has not always inspired critical praise. This lack of critical approval, Klugh admitted in Guitar Player, is due primarily to his conscious decision to sell records rather than just showcase his playing ability. The choice reflects the musician's business savvy and the skills he has acquired working with established artists. As he maintained in Guitar Player, learning what sells and what doesn't has allowed him to continue to play. And despite Klugh's concerns with the market, he is insistent on playing the kind of music he likes. Given the enormity of his yield and the success he has achieved, it is clear that a large number of record buyers share his tastes. 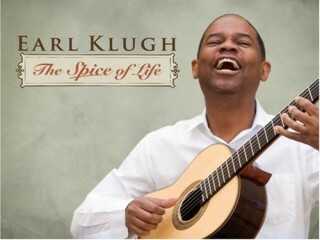 In 2006 Modern Guitar magazine wrote that Klugh "is considered by many to be one of the finest acoustic guitar players today." - Earl Klugh Blue Note, 1976. - (With Bob James) One on One Columbia, 1979. -(With James) Two of a Kind Capitol, 1983. -(With George Benson) Collaboration Warner Bros., 1988. -Whispers and Promises Warner Bros., 1989. -Solo Guitar Warner Bros., 1989. -Best of Earl Klugh, Volume I Blue Note, 1991. -Earl Klugh Trio, Volume I Warner Bros., 1991. -(With James) Cool Warner Bros, 1992. -Best of Earl Klugh, Volume II Capitol, 1992. -The Earl Klugh Trio: Sounds and Visions, Vol. II Warner Bros., 1993. -Living Inside Your Love Blue Note. -Crazy for You Blue Note. -Midnight in San Juan Warner Bros.
- Dream Come True Liberty/United Artists. -Magic in Your Eyes United Artists. -Soda Fountain Shuffle Warner Bros.